Himalayan Trust Nepal is going to organize its 9th Annual General Meeting. The foundations are now complete at many of these schools and the walls are going up.Thanks to everyone who supported the earthquake rebuild appeal and made this work possible. Latest photo(as of June 2016) of Lumukarma Primary School, Beni Lower Secondary School, Junbesi Secondary School,Pike Secondary School,Janajagriti Higher Secondary School,Jwalamai Primary School and Goli Lower Secondary School. 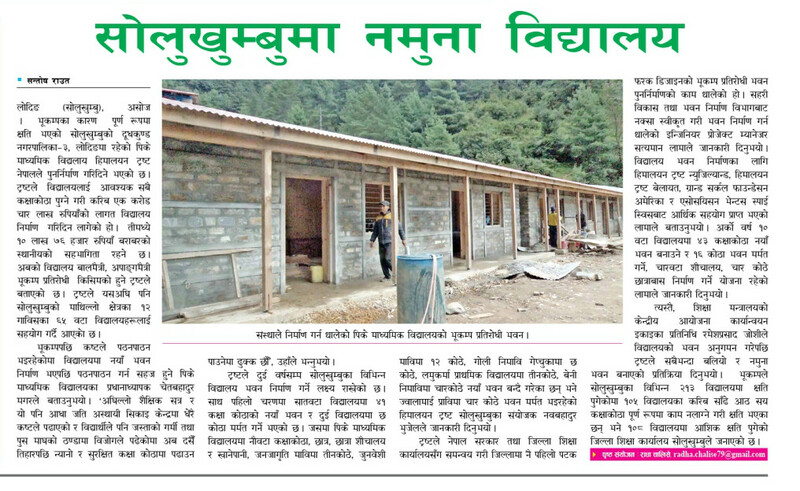 The National Daily newspaper (Gorkhapatra) published the update of Himalayan Trust Rebuild Project.